For over 30 years Digatron has pioneered digital instrumentation for karts. What started as engine monitoring has now been developed and engineered into Performance Data Acquisition Systems. 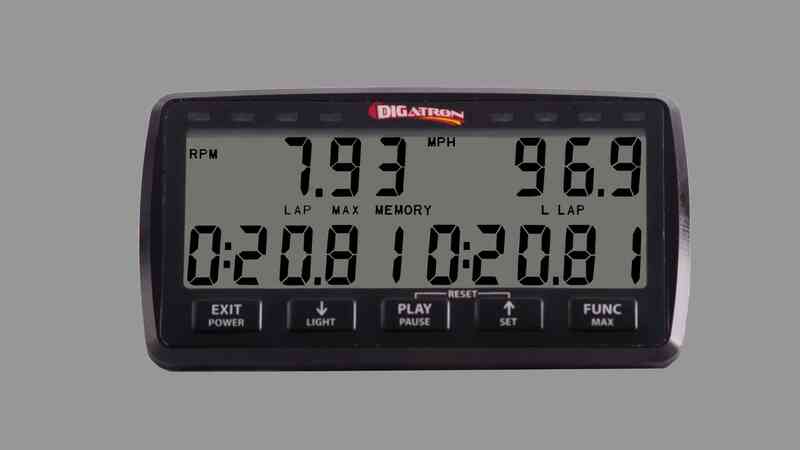 To meet the needs of all racers Digatron offers three lines of instrumentation. From the "more information the better" Digatron has developed a data acquisition system that meets your needs. Experience the best in data acquisition while learning about your kart and driver performance. Graph your functions for a detailed visual of your race and learn how all functions work together to help you race faster. Engine RPM (Tachometer), Jackshaft RPM or Speed (MPH or KPH) and up to four temperatures. (8) Highly visible red LED. warning/shift lights. I purchased a DT52K-Max last year for my son’s kart, and I have been very happy with its performance and capabilities. One notable feature is the data logger’s detail when graphed using your free software. The unit is so sensitive and records so many data points per second that I can actually focus in and see exactly what is going on with the clutch as it engages, slips, and finally locks up on starts and restarts. After analyzing this information, I was able to monitor and tune the clutch to obtain a visible, on-track advantage on the starts. I can actually see how heat builds up and causes a decline in the clutch’s performance during a race with multiple restarts, and clutch wear is evident from increased slip time. It has shown me why some clutches are really better than others. We have won races because we were able to jump out ahead of competition during a start and I know it is because of the information I gained from the Digatron. If you want the basics in a simple, easy-to-use package, this series is for you. These instruments keep track of your maximums and lap times and will make you proud to be a racer in the United States. Maximum readings of all functions. Minimum readings of RPM. Times displayed to the 100th of a second. Free P.C. Downloadable software. Features: Custom instrument configuration, charts, and log book. USB and serial computer input. To me there is No Other. Love your products. This affordable instrument is perfect for your first venture into data logging. Review lap times and maximums in addition to a detailed playback of your race on the instrument. Full half hour of data logging and detailed playback. All functions record 10 times per second. Times displayed to the 10th of a second. As the manufacturer we offer a large variety of instruments, accessories and options. We encourage you to call us with any questions regarding our instruments and a dealer near you. All instruments have thermocouple temperature functions. Either a CHT, EGT or Water Temperature sensor can be connected to a temperature function on the instrument. The limit entered in the instrument will determine if the instrument displays CHT or EGT. If a temperature sensor is not used a shorting plug must be placed on the instrument. The new DT-30 K series now offers the following: maximum readings, warning limits, warning lights, lap timing (optional) and maximums by lap (optional). These instruments are VERY easy to use and retain their durability. Displays are the same size as the previous model but the instrument itself is smaller. The DT-50K models have a new front, simplified side button operations and sensors that connect directly to the back of the instrument. The red front is available by request. Sensors can be ordered at any requested length. Sensors above five feet will be made into a two-piece sensor.